the summit of Mt. Harvard. At an elevation of 14,427 feet, Mount Harvard (38.92444°N / 106.32058°W) is the fourth highest peak in the lower 48 states and the third highest in Colorado, behind nearby Mt. Elbert (14,440) and Mt. Massive (14,428). 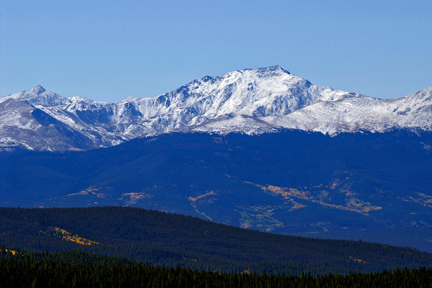 It is part of the Sawatch Range among the "Collegiate Peaks", which also include Mt. Columbia (14,080), Mt. Oxford (14,159), Mt. Princeton (14,204), and Mt. Yale (14,201). (Elevations are from a 2001 survey.) The peak lies within two kilometers of the Continental Divide in Chaffee County. As part of the Collegiate Peaks Wilderness area of the San Isabel National Forest, it is under the jurisdiction of the US Forest Service. The Harvard School of Mines closed due to lack of enrollment in 1874. (The Colorado School of Mines had been founded the previous year.) Its remnants were incorporated into the Lawrence Scientific School (founded in 1847), an ancestor of the current School of Engineering and Applied Sciences. Professor Whitney also led many surveys in California, and Mt. Whitney (14,494 ft.), the highest point in the lower 48, is named for him. There is also a Mt. Harvard (5441 ft.) in California's San Gabriel mountains. The best highway views of Mt. Harvard are from US 285 between Buena Vista and Salida and CO 82 between Leadville and Independence Pass. Have you climbed Mt. Harvard? We will publish a directory of Harvard alumni who have done so. To be included, send us a note with the date and any other relevant particulars.